Allied health covers a wide range of topics and offers a flexible program tailored to your career goals. Allied health provides the life-science foundations, critical thinking skills and the ethical training required of today’s health professionals. Our flexible program offers a four-year degree tailored to your career goals, whether you plan to be a clinician or an administrative professional. You can choose from a concentration in general science or health care administration. You will learn from full-time faculty members and adjunct professors — some who practiced or continue to practice in an administrative or clinical setting. They will share personal experiences, and engage with you in and out of the classroom. As an allied health major at Manhattan College, you must complete an internship experience during your senior year in a setting relevant to your career goals. You will be placed or can choose a health care facility or hospital in the New York City metro area. We prepare students to be competitive applicants in health professions schools. The Center for Graduate School and Fellowship Advisement (CGSF) and the Health Professions Advisory Committee (HPAC) will support as you pursue a career in medicine, dentistry or allied health fields. We will help you fine-tune your curriculum, activities and internships relevant to your goals. “I want to help people, but I don’t want to go through 12 years of medical school to do it. I’m going to be a Physician Assistant (PA). “I’ve always known I wanted a career in the medical field, but I wasn’t sure I could handle the pre-med work. In fact, I changed my major three times. After I did well in my first chemistry course, I spoke with a Pre-PA student majoring in Allied Health. I knew that the general science concentration was right for me. “My courses focus more on patient care and ethics in healthcare. One of my courses brought in medical professionals to speak about their jobs. These classes are relevant to my career goals. “My Anatomy and Physiology (BIOL 207 & 208) classes weren’t what I expected them to be — I loved them! It was a lot of work, but unlike the pre-medical requirement, it was only focused on the human body. My ethics course is taught by a former nurse – we discuss a lot of controversial topics, such as abortion and organ donation. 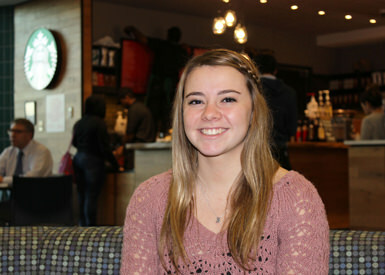 “What’s cool about Manhattan College is that some of my courses are taught by professors who have worked in the field. It has been so helpful to hear some of my professor’s stories and really put the topics in context. “I’ve completed a summer internship at the North Shore LIJ Cohen’s Children’s Hospital in the department of hematology and oncology. It was really intense. I shadowed a PA and got to see the difference between short term and long-term care. Also, I sat in on a few tumor boards – where clinicians from many different areas come together to talk about each case. It was interesting but often sad. Gain a humanistic approach to health care delivery. You will examine wellness from biological, psychological and sociological perspectives. …with a general science concentration? Most students pursue master’s degrees in occupational therapy, physician assistant, nutrition, public health or various health sciences. Some students pursue medical or dental school after following a the pre-medical/dental prerequisites. Yet, you may choose to seek employment immediately after graduation. …with a healthcare administration concentration? Pursue a master’s degree in health care administration, business administration, public health or public administration. Or you may choose to take an entry-level administrative position in a variety of healthcare settings, including hospitals, nursing homes and community-based health programs. According to Payscale, the average pay for an entry-level healthcare administrator is more than $55,000 per year. My professors at Manhattan got me to where I am today. Hospital Organization and Management was one of my favorite classes. It focused on common sense problem solving skills that we could all use in the medical administration/management fields. The healthcare law and ethics courses were so influential that it actually led me to pursue a career in healthcare administration. Radiological & Health Professions Dept.